Ran across a story on a South Carolina high school who sent a girl home for wearing a t-shirt that read: “Nobody Knows I’m a Lesbian.” That took me back about fifteen years to the time I saw that same t-shirt on a fat, bald, bearded 40-something man smoking a big cigar as he leaned on the exterior wall of the Monteleone Hotel in the French Quarter. Ah, I love New Orleans. * WaPo’s Ishaan Tharoor reminds us a climate-change “skeptic” who’s even more skeptical than Tony Abbot is still in power in Canada, but may not be after October 19. * Nick Confessore reports Democrats may be about to use Super-PACs in a big way for down-ballot races if the FEC gives them the green light on certain loosey-goosey tactics GOPers are already using. * At Ten Miles Square, Martin Longman argues the U.S. has a responsibility to accept Syrian refugees but needs to understand they will bring their grievances with each other with them. 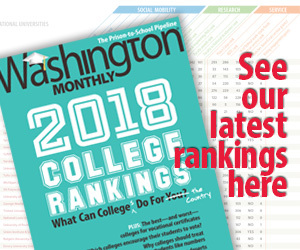 * At College Guide, Rachel Fishman reports the Obama administration has made a key improvement in the process of applying for student financial aid. * El Nino brings with it the threat of more snakebites. Yikes. But we sure need the rain.